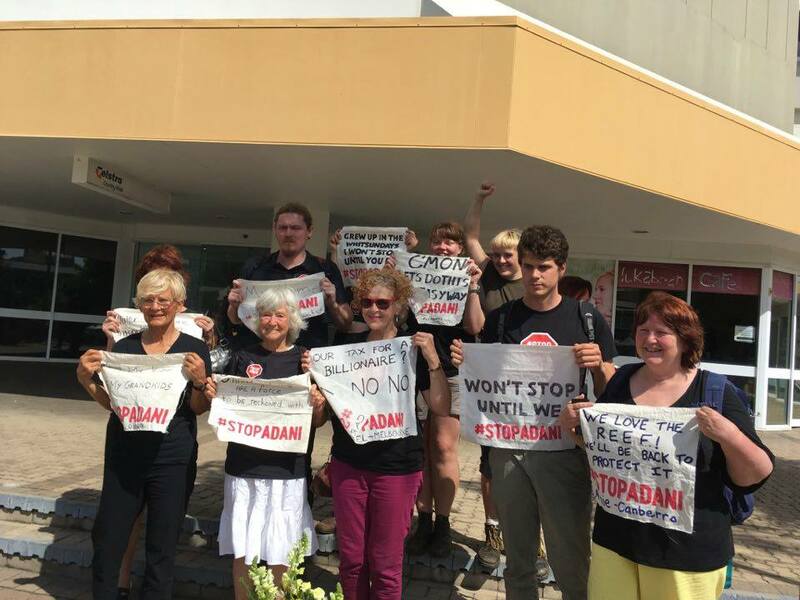 As Adani promises to start work on Australia’s largest ever coal mine next month, dozens of locals have launched a peaceful community campaign to ensure the project does not go ahead, vowing to engage in non-violent civil disobedience to protect the Reef, climate and local communities from Adani’s plans. With Adani promising to start construction imminently, now is the time to step up like never before. Senators Canavan and Christensen arrived at the Pier Restaurant in Townsville to find us waiting for them. These fossil fool lobbyists / politicans are trying to condemn us to 19th century technology and a climate collapse future. "Not going to happen!" say the activists. In this photo, Aunty Carol Prior addresses the media outside the restaurant. The same day, 18 activists occupied Adani HQ. 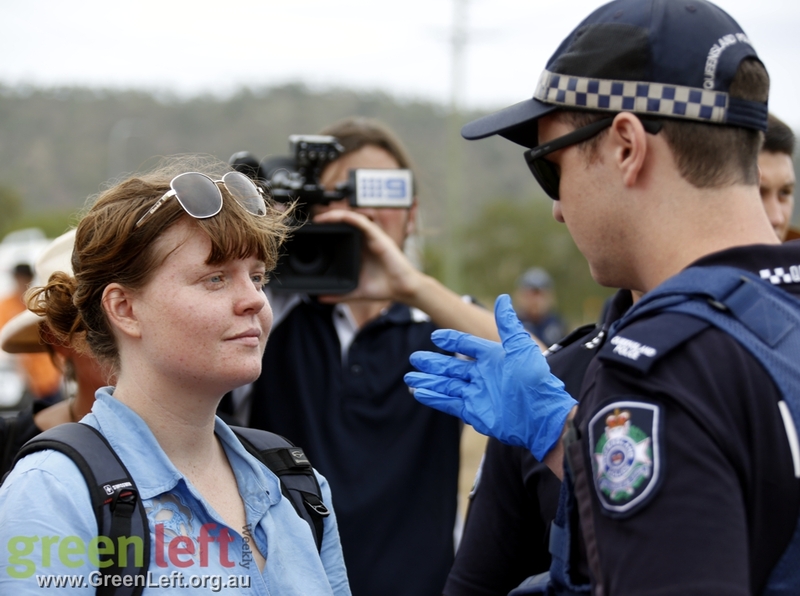 Yesterday a state government report confirmed Adani released polluted water into wetlands and coastal waters, so today we walked onto Abbot point to demand a citizen inspection of their operations, check out the video! 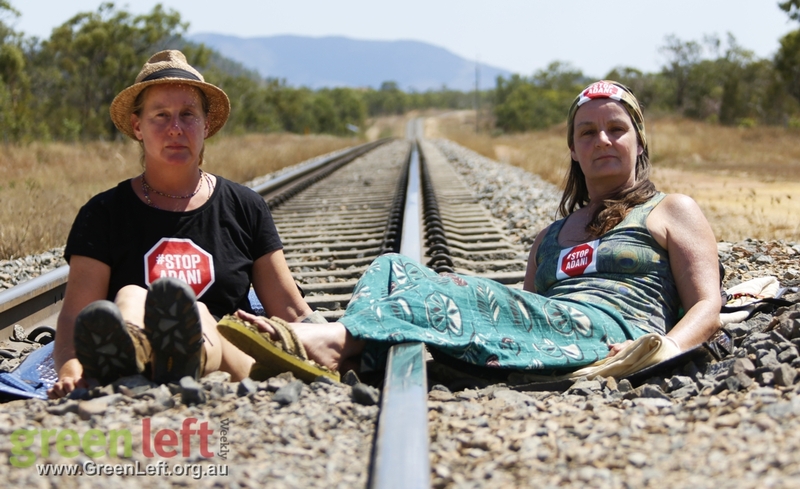 The main action organised as part of the Week of #FronlineAction on Wednesday was a rail action where two strong women connected themselves to the rail line to block coal trains leading to the port. The sun was hot but the two women stood staunch in the heat. They stopped the train line for about five hours. 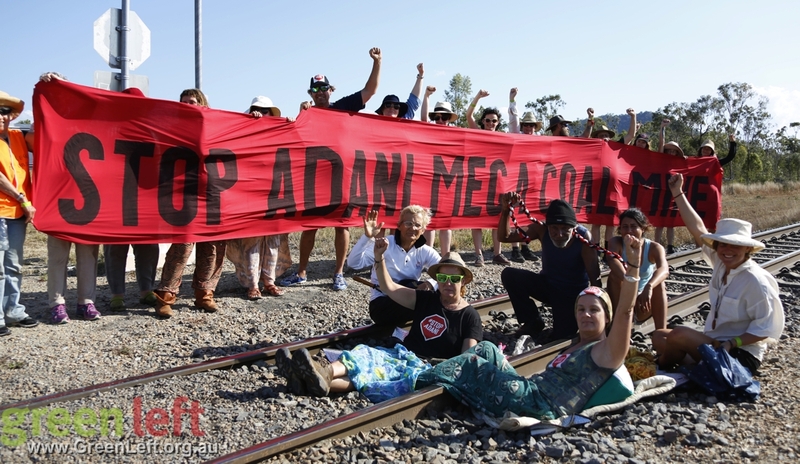 Dozens of supporters took part in the action carrying signs reading "Stop Adani Mega Coal Mine" and a banner to "Save the Great Barrier Reef". Arrestees were all presented with a mango at a camp gathering on Tuesday night. The first arrestees from this mornings action have returned to camp, greeted by a standing ovation and heartfelt applause and congratulations. 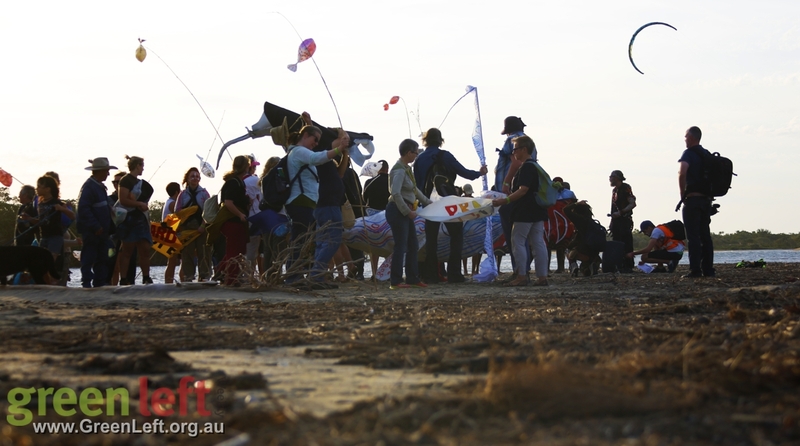 Activists are jubilant after a successful action at the Abbott Point Coal Terminal. Holding big signs to spell "We will Stop Adani" and a banner reading "Reef jobs not coal jobs" protesters from #CampBabirra blocked the road leading to the Port. Ten people were arrested and a number more were given move-on orders. 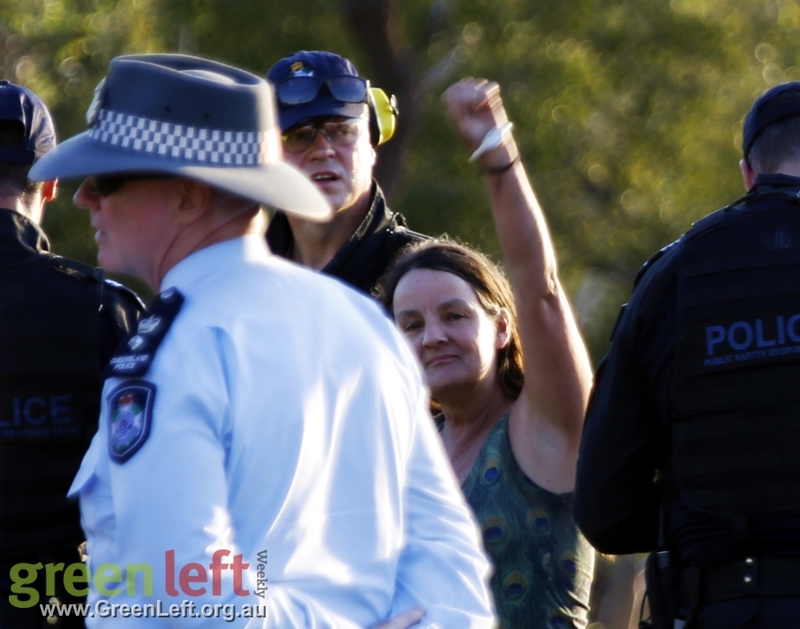 More photos can be found on the Green Left Facebook Page and the Front Line Against Coal Flickr album. Workshops on non-violent direct action and legal rights for protesters have been among the activities for today. In addition, planning is underway for actions later in the week. "Today we stand strong," Uncle Kenny told the assembled crowd as we gathered before a lantern walk along the beach. 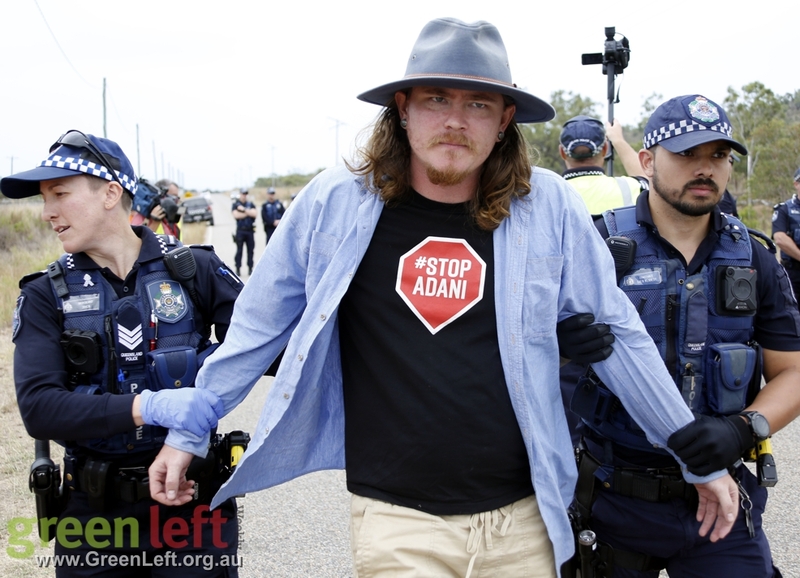 This was the first action as part of the #StopAdani week of frontline action. "All our generations, that have walked this land, our ancestors who have canoed these waters and fished and hunted from this land," he continued. "We have descendants and bloodlines that have been here for thousands of years and we have generations that have come and that stand here strong and proud. From Aboriginal people and Torres Straight people to South Sea Island people. We stand united as Salt Water People on our land." People carried lanterns, many in the form of whales, as a positive action to kick off the week's events. #CampBabirra is extremely well organised. When you rock up, there is a registration desk where people can sign in, make a financial contribution to cover costs and volunteer to help run the campsite. We are in Bowen basin. Adani's Abbot Point Coal Terminal is just 20 minutes north of Bowen, and the train line that brigs the coal to that port sits nearby. As you can see on the map, there are many existing coal mines in the area. South-west of where we are is the Wangan and Jagalingou Native Title Claim on which Adani wants to build one of the world's largest coal mines. 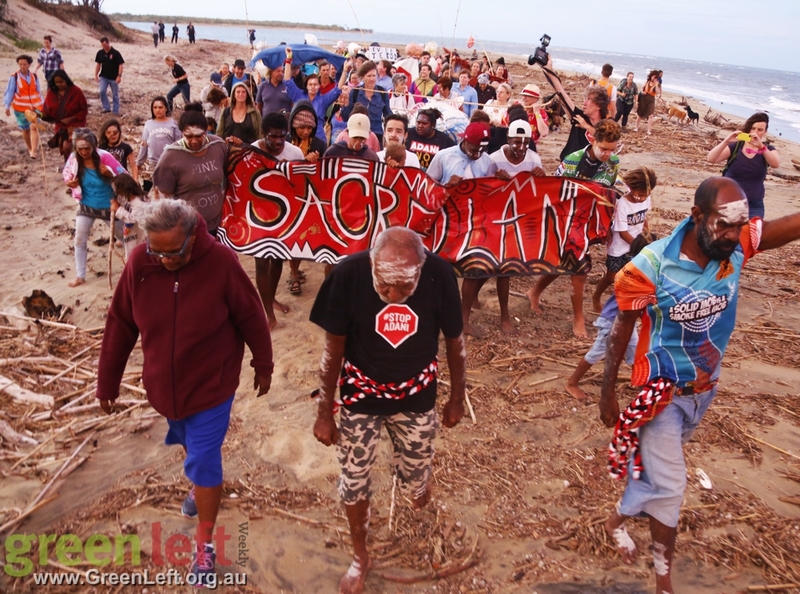 This fight to stop Adani is part of the broader struggle for First Nations' land rights, climate justice and creating a more equitable society. When you look around this camp there are people from all over the country who have petitioned, rallied, spoken to politicians, handed out flyers, held screenings, taken up legal challenges, stopped work and so much more. We need a diversity of tactics and this week is an important part of stepping up this pressure and building on what is already happening. We are here to take non-violent direct action, to ensure Adani and its political backers don't get away with plans to build Australia's largest ever coal mine. We will directly intervene to protect the country, reef, water and our climate from a billionaire's dodgy mining company. As a movement, [we] have tried all available legal and political channels to stop this mine, but it is clear that those things alone are unlikely to succeed in stopping the mine. Adani has committed to start work in October. We are now peacefully putting our bodies on the line to say this cannot continue. 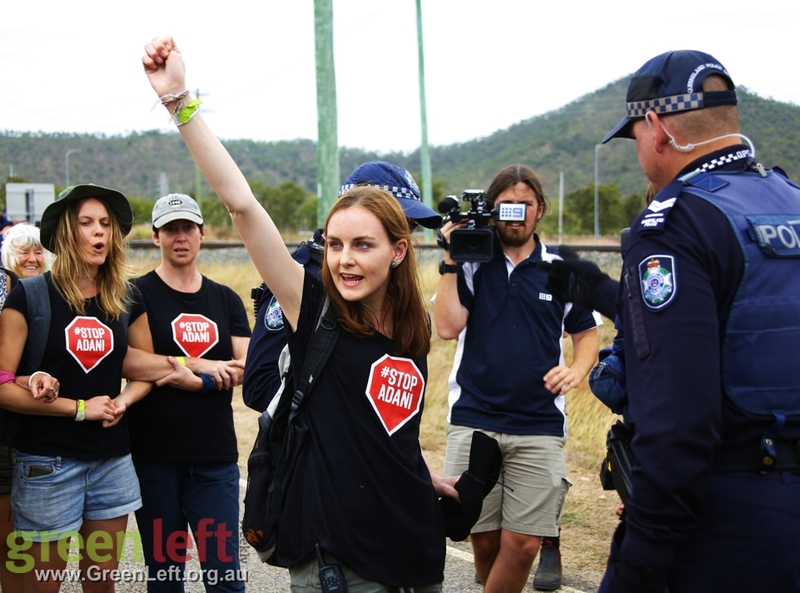 Direct action is a powerful tool that has played a core role in many successful campaigns here in Australia and all over the world. 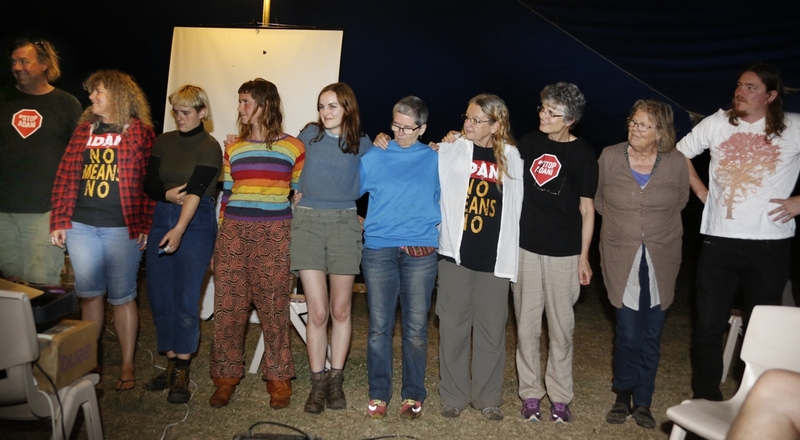 Protecting the Franklin River, stopping uranium mining at Jabiluka, halting gas in the Northern Rivers at Bentley - all of these victories came about in large part because of the everyday people who stood up and took sustained and non-violent direct action when politicians had failed. In the context of the Adani fight, direct action increases the risks for any company wanting to finance Adani or work on the project. It keeps the campaign in the political and media spotlight as people demonstrate the depth of their resolve to protect the country, reef, water and climate. And crucially it is a place for hundreds if not thousands of people to learn the skills of direct action and social change to take back to their communities, building a movement of skill-sharing and community building that can rise to the many challenges our societies are facing. 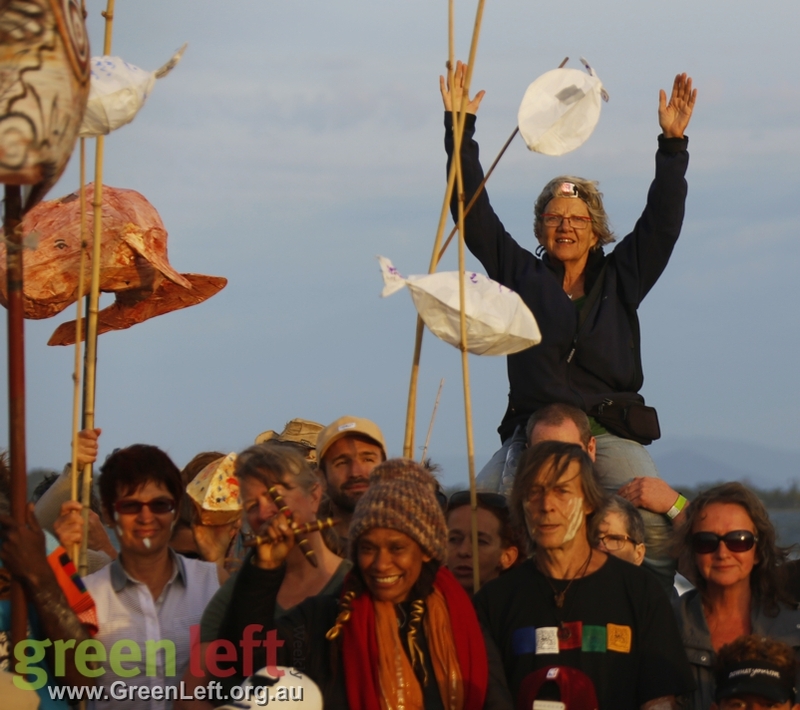 More photos from the action can be seen at the Green Left Facebook page. 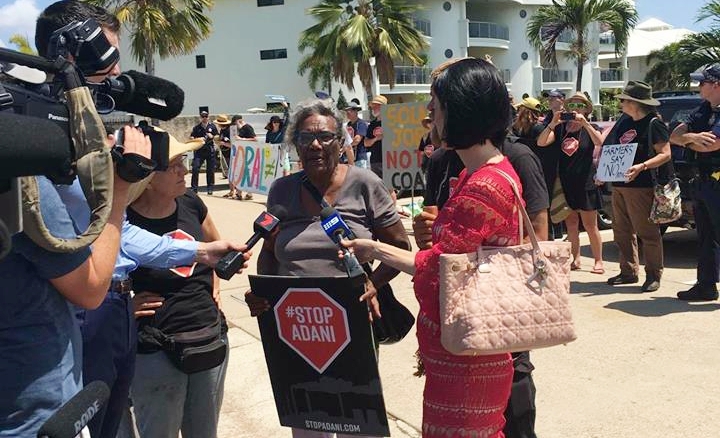 Information about the Week of Frontline Action to Stop Adani can be found here. Follow this campaign on twitter at #StopAdani.